It comes as a surprise to many to hear that natural gas is one of the safest transport fuels available. Natural gas is a naturally occurring product, consisting mainly of methane (approx. 90%). In its natural state, natural gas is odourless. As a safety measure, the gas is odorised prior to distribution to provide a ready means of leak detection. An average person can easily detect the smell of gas at a concentration as low as 0.3% by volume in air. That concentration is about 16 times lower than the level which will support combustion. Natural gas requires a concentration of between 5% and 15% in air for combustion to occur, meaning in most cases the smell of gas would be detected well before combustion conditions are met. These are the upper and lower flammability limits of the fuel. Natural gas also has a high ignition temperature, about 600 degrees Celsius, compared with about 315o C for gasoline (1110o F). Natural gas has no known toxic or chronic physiological effects (i.e. it is not poisonous). Exposure to a moderate concentration may result in a headache or similar symptoms due to oxygen deprivation but it is likely that the smell would be detected well in advance of concentrations being high enough for this to occur. The fact that natural gas is lighter than air further enhances its safety. Unlike other fuels such as diesel, petrol or LPG, which are heavier than air, should a natural gas leak occur, the gas will readily dissipate into the atmosphere. This eliminates the risk of the fuel accumulating or pooling at ground level and causing a greater risk or hazard. As CNG is stored at high pressure, it is often perceived that the high pressure of the product makes it more hazardous than other fuels. While a high pressure gas leak tends to make a lot of noise while the gas is escaping, the high pressure forces the gas to escape very rapidly causing high concentrations of gas to build up in the immediate vicinity of the leak. The resulting high concentrations of gas and its tendency to dissipate upwards make it less likely for the gas in the immediate vicinity of the leak to ignite. Naturally, the high pressure does cause the gas to escape with some force so obvious precautions are necessary. As for all automotive vehicles, NGVs require regular maintenance to limit preventable accidents. For CNG powered NGVs regular inspection of the high pressure fuel storage vessel(s) and fuel system components is best supported by a system that monitors compliance to national or regional regulations. 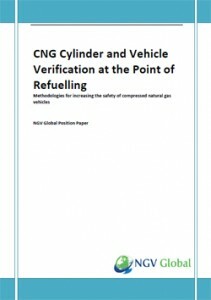 In December 2011, NGV Global issued a position paper recommending RFID systems as a means of verifying CNG vehicles and cylinders at the point of refuelling. The position paper concludes that RFID systems, properly implemented, “have the highest likelihood of detecting tampering or foul play of a vehicle’s natural gas system while providing the highest degree of verification”. Maintenance and repairs of NGV fuel systems should only be carried out by trained personnel. 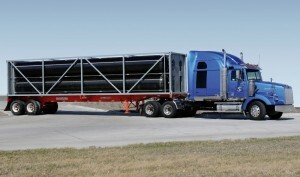 Lincoln Titan modules transport natural gas where infrastructure does not reach. Natural gas has been distributed safely for years. In most circumstances, it is delivered via underground pipeline networks, the same networks that deliver natural gas to our homes and businesses. This method not only eliminates the need for road tankers to deliver fuel from the refinery, but also the need for ocean going oil tankers to deliver crude oil to the refinery. Hazards associated with each of these delivery methods are unfortunately well known and even in the event of a ‘harmless spill’ (i.e. without any resulting fire) the issues associated with cleaning up present additional safety and environmental problems. Natural gas is also distributed by compressed natural gas modules and tube trailers, designed to internationally approved standards for delivery to non-pipeline and remote refuelling stations. While natural gas can be demonstrated to be safer than traditional fuels, readers are reminded that proper safety procedures should be followed and only qualified and registered personnel should work on natural gas systems.